Family: wife Karen (retired high school English teacher), two adult daughters. Hobbies: Has a private pilot license, enjoys flying when he has spare time. Previous elected offices, if any: Davidson County Commission (including chair), from 2002 to 2014. What do you think will be the biggest issue at the legislature this year? Medicaid’s effect on the budget. What’s one specific campaign promise that you’d like to deliver on? Doesn’t have one. “I’m not a single issue candidate.” He hopes to work on issues affecting the state’s building code and construction industries, in addition to other policy issues. Do you think the state should expand the Medicaid program? Why or why not? Doesn’t favor expansion, but says he may change mind in future. Watford sees the benefit of expanding Medicaid to help people, but has concerns about how the state could afford to do that when the program routinely experiences cost overruns. “It goes back to the same thing, I can’t see expanding Medicaid until the program is under control,” he said. How do you feel about the state’s minimum wage ($7.25 an hour)? Should it be raised? Not in favor of raising it. “I haven’t worked anyone in my whole career at minimum wage except for some high school kids,” Watford said. He believes that the market takes care of the inequities, and that employers should be able to pay low-skilled, younger workers minimum wages, while older, more skilled workers should be able to find higher wages. 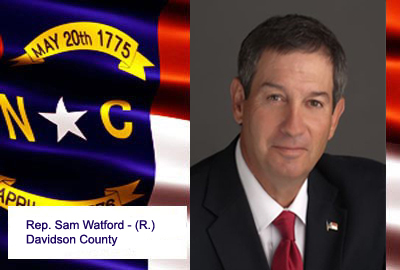 Contact information: His legislative office in Raleigh, (919) 715-2526, or email, Sam.Watford@ncleg.net. Previous article Amy Adams of Appalachian Voices discusses ongoing efforts to clean-up North Carolina’s coal ash, one year after the massive Dav River spill.